Great as a home basement, crawl space and commercial low temperature dehumidifier. The Ebac CD30 Dehumidifier & Ebac D30E Dehumidifier are ideal for crawlspace and basement conditions in residential environments as well as hostile industrial or marine locations. 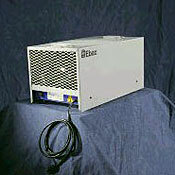 They are simple to operate and set-up and small enough to transport between job sites. Being only 12 inches high and 12 inches wide it can fit through the tiniest opening if accessing a crawl space or remote area. Energy efficient: Runs at a low amperage draw of 2.5 amps per hour, resulting in low energy costs. Small size: This dehumidifier is great for small areas such as crawlspaces – only 1 ft. high. Low temperature operation: Will operate down to 33°F before shutting off. The “Hot Gas” defrost automatically eliminates frost build up. The Ebac CD30 & CD30E are excellent for residential use in crawl spaces as well as in industrial and commercial applications. By utilizing Hot Gas Defrost we are confident it will continue to dehumidify even if the temperatures drop as low as 33 degrees. Its dimensions enable it to be set-up in the tightest of spaces. Even though it is small, it is sturdy and will last with its steel chassis and powder coating inside and out. It is very quiet at 47 dba and is conservative on energy consumption to not hurt one’s pocketbook. About the only thing one may to contend with is to raise it to assist the water to drain properly with gravity. Like its size this model is not going to dehumidify an area larger than 400 square feet so it is something to be considered when choosing a dehumidifier. If one wishes to wall mount it they should purchase the CD30E model which comes with a mounting bracket. The choice is simple. If you are looking for a reliable well built dehumidifier for a small area where extreme temperature and humidity will be a consistent reality, the CD30 or the CD30E is the answer.